Lead is one of the most recycled materials in the world and the main source of secondary lead is from lead acid battery recycling, with global recycling rates estimated at around 95%. However due to the toxic nature of lead and corrosive battery acid, Used Lead Acid Batteries (ULAB’s) are a controlled “Hazardous Waste” and designated “Dangerous Good” in relation to their storage, handling, transportation and recycling. As such there are several State and Australian Federal Government regulations, to help ensure their safe and environmentally sustainable storage, handling, transportation and recycling of lead acid batteries. This white paper provides an overview of the Australian lead acid battery recycling industry and highlights practices that are working well and those that are not. 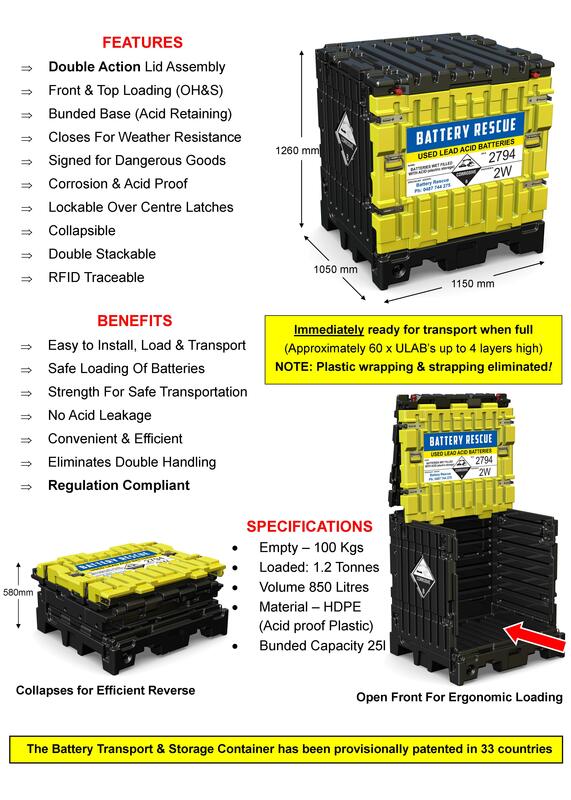 It also, unashamedly promotes how Battery Rescue’s battery collection service, through the use of the purposely built Battery Transport & Storage (BTS) Container, addresses most of the major short comings that occur during the storage and transportation of the batteries to the Battery Reprocessors. The Battery Rescue collection service will ensure regulation compliance by virtually all participants in the lead acid battery recycling industry while reducing the environmental impact and health and safety risks to employees and the public. Batteries are arguably the most important product of the industrialized world. Almost every car, bus, boat, plane, tractor, bulldozer, motor cycles and even golf buggies would not exist but for the humble battery. The computer industry relies heavily on batteries as back-up power supplies. Even wind generators and solar energy rely on batteries as part of their power management systems. Batteries are ubiquitous and have been an absolute boon for the modern industrialized world. However, batteries have a dark side, 95% of all batteries in the world (by volume) contain the commercially essential element lead, with 80% of all lead produced used in the production of batteries. According to the World Health Organisation, lead is the world number one toxic poison in regard to the number of humans affected and currently suggests there are no known levels of lead exposure that are considered safe. There are more people negatively affected with serious health impairments such as birth defects, retarded development, neurological problems and death than with any other toxic substance (The Lead Group www.lead.org.au). The battery electrolyte (sulfuric acid) contained in most lead acid batteries, contains high lead levels and other toxic heavy metals and the acidic electrolyte can also result in burn injuries, damage to property and is toxic to humans and the environment. Due to its fundamental properties and that lead based products are easily identifiable and economic to recycle, lead, is one of the most recycled materials in the world. Recycled lead provides 55% of the world’s lead use, with about 80% used in lead acid battery manufacture (International lead association). Globally lead acid battery recycling is a $24 Billion industry, per annum, while in Australia the industry is worth approximately $180 Million, per annum. The estimated quantity of ULABs available for recycling in Australia in 2012-13 was around 137,000 tonnes (ABRI www.batteryrecycling.org.au Oct 2014), with approximately 84% or 115,000 tonnes being recycled. This compares poorly to the USA where used battery recycling rates are close to 100%. The remaining 16% are lost to illegal landfill, export or are just left in residential homes, farms, mine sites and indigenous communities. The enormous distances and hence cost involved in transporting the ULABs to the 4 lead acid battery recycling plants, 3 of which are located in NSW, is a significant factor contributing to our reduced recycling rate. 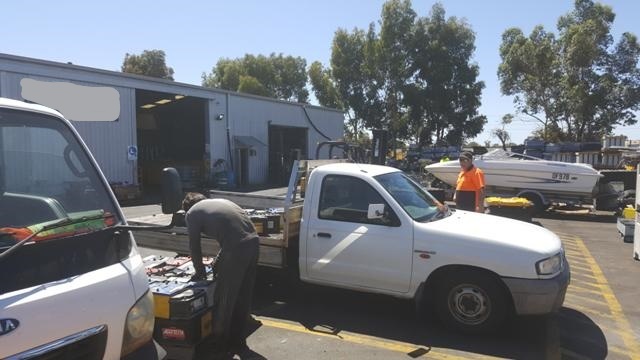 The public play an important role in ensuring that car batteries are correctly recycled and don’t end up rotting in backyards or disposed of in council rubbish bins where the batteries will usually end up in landfill. In Australia, the collection of Used Lead Acid Batteries (ULABs) for recycling is mostly carried out by the scrap metal industry who collect from a wide range of Used Battery Generators (UBGs), such as automotive, marine, mining and industrial companies & government organisations. Most often they will pay the UBG somewhere between $0.05 and $0.40/kg, but sometimes they will be supplied the ULABs at no cost. 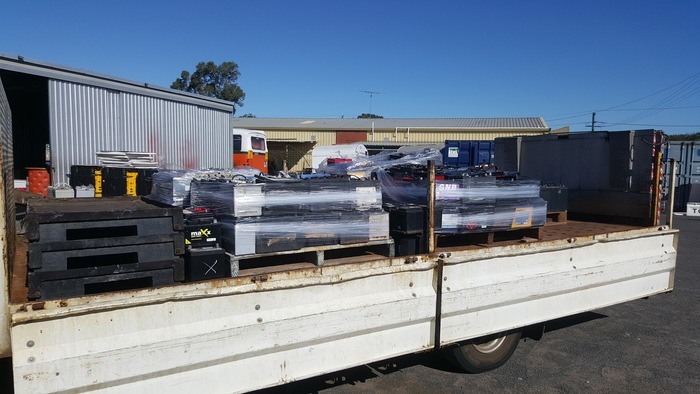 ULAB’s collected from the Used Battery Generators may pass through several scrap metal companies before ultimately being delivered to one of four lead acid battery recycling facilities, in Australia, three of which are located in NSWs and one in Queensland. The majority of batteries are sold to the reprocessing plants by the Large Scrap Metal Aggregators and Specialist Used Battery Collection Specialist. The reprocessing plants, then “break and separate” the batteries, producing lead chips, which can be melted to produce lead ingots and a lead paste, which requires a high temperature smelter process to extract the lead. The sulfuric acid is converted to Sodium Sulfate which is commonly used in fertilisers and laundry detergents and the plastic polypropylene container is output as pellets for reuse in new battery containers and other plastic products. Nearly 98% of the lead acid battery is recycled, with the remainder disposed as slag. The recycling process is strictly controlled by state environmental regulations which help ensure that the recycling facilities have minimal impact on the environment and health of their workers and public. Australian recycling practices compare favourably with most parts of the world and play a very important role in keeping lead acid batteries out of the environment and reducing the demand for newly mined lead. About 60% of global lead needs are met from recycling and 40% from newly mined sources. The majority of lead acid batteries in Australia are transported using wood pallets. This is because they are ubiquitous, relatively inexpensive and preferred by Australian Battery Reprocessors. The Australian Code for Transportation of Dangerous Goods, requires batteries that are stacked on wood pallets to be separated with a non conductive layer (which should be a minimum of 20mm to protect the superimposed layer from the terminals of the batteries below) and then wrapped in plastic and strapped for transportation to the Reprocessors. Poor training and the lack of availability of the right materials has resulted in the systemic non-compliance of these packaging and load restraint requirements, resulting in increased risks to the public and environment, in the event of an accident. The wood pallets also have no means of capturing any acid leaks, with acid leaking directly onto the vehicle’s floor and into the environment. Despite the limitations of this method, it is predominant method used by the industry and if done correctly complies with current Government Regulations. The “elephant in the room” is that this regulation compliant method is generally only used when transporting batteries interstate to the Lead Acid Battery Recycling Plants. For local (intrastate) battery pickups, which occur much more frequently, batteries are often transported loosely in the back of vehicles (see figure 2) or for volumes of a tonne or more they may be stacked on a wood pallet and wrapped in plastic but no strapping or dangerous good signage is applied (see figure 3). In our opinion the use of the wood pallet is one of the major causes for the systemic regulation non compliance that is occurring in the lead acid battery recycling industry. We believe that wood pallets should not be used for the storage & transportation of lead acid batteries. Aggregation of the used batteries, by the Scrap Metal Aggregators and Specialist Used Battery Collectors, occurs in most major cities and regional centers, before the batteries are “wrapped and strapped” for transport to the reprocessing plants. This double manual handling of batteries, besides being inefficient, increases health and safety risks to Australian workers , the public and to our environment. Batteries collected, by the aggregators and specialist collectors, are usually stockpiled, often outdoors in a non bunded area or device (see figure 4). This allows battery acid to leak into the soil and drainage systems. The battery acid contains high levels of en-trained lead and other heavy metals at levels that are considered unsafe to humans and the environment. See our post “Australian public & environment unnecessarily exposed to toxic lead”. Used Battery Generators (UBG’s) – are organisations that produce reasonable quantities of used batteries such as automotive, marine, mining, battery resellers, industrial companies & government organisations. The UBG’s store their ULAB’s on their premises until they are collected by the Scrap Metal and Battery Collection companies. They are usually paid for the batteries. The majority of UBG’s are not meeting the various storage and handling regulations for used lead acid batteries, with batteries stored outdoors, in a non bunded area or device and not correctly addressing the Workplace Health & Safety risks associated with hazardous chemicals. They are also not meeting their consignor “chain of responsibility” obligations when transporting lead acid batteries. Scrap Metal Traders – are generally small, one man illegal operators. 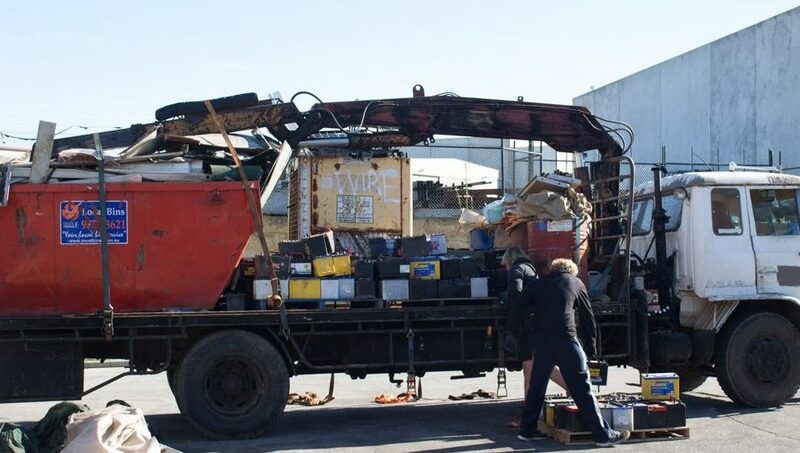 The Traders, who are often un-licensed (a compulsory Controlled Waste License is required), collect ULAB’s from the UBG’s informally (often no invoice provided as required) with batteries stacked loosely in their vehicles, and not packaged and secured as per the requirments of the Australian Code for Transportation of Dangerous Goods. 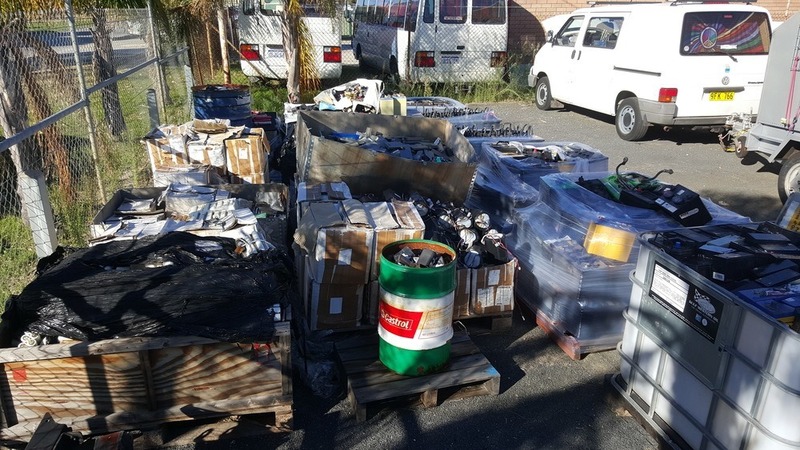 The Scrap Metal Traders will usually on sell the batteries to Scrap Metal Dealers, Aggregators and Specialist Used Battery Collectors for cash. Specialist Used Battery Collectors (SUBC’s) – specialise in the collection of ULAB’s and hence are generally better equipped to handle their collection, transportation and storage. They will collect directly from UBG’s, but also from Scrap Metal Dealers and Traders. Despite specialising in and being better equipped to collect batteries, the majority of SUBC’s are failing to transport the batteries in a compliant method when collecting locally from the UBG’s and SMD’s (see figure 3 above). When the SUBC’s on sell their batteries to the reprocessing plants they will wrap and strap the batteries on a wood pallet, in attempt to transport the batteries in a regulation compliant manner, however many are failing to use an adequate separator (should be 30mm) when packaging multiple battery layers on a wood pallet. Scrap Metal Aggregators –These companies aggregate very high volumes of ULAB’s, with the majority of their batteries obtained by buying them from SMD’s and Traders. Like the SUBC’s, they also do some collections direct from UBGs. The collected batteries are also often illegally stored outdoors and / or in a non bunded storage device. Waste Management Companies (WMC’s) – manage the collection of ULAB’s in conjunction with Scrap Metal Dealers and Aggregators. Waste Management Companies are often effectively brokers. They offer medium and large companies a professional negotiating service where they endeavor to deliver them a cost saving and vetted collection companies to collect their waste in a regulation compliant manner. Some WMC’s will perform the collection and aggregation of ULAB’s themselves and on-sell the batteries to the reprocessing plants. These WMC’s are usually non compliant with Government regulations in the same way that Specialist Used Battery Collectors are. Transport Providers – are the companies that transport the palletized, wrapped and strapped ULABs, often interstate, to the reprocessing plants. The majority don’t like transporting ULAB’s as the batteries often leak acid onto the floor of the vehicles and can, due to the weight of the batteries and shoddy wrapping and strapping, shift during transportation. The transport company is the one that has to wear the cost for the driver to stop and repack the batteries. Battery Reprocessing Plants – are the companies that recycle the ULAB’s and sell the recycled lead. They will generally only accept batteries that have been transported in a regulation compliant way (i.e. wrapped and strapped on a wood pallet). They have to frequently deal with loads that have broken their packaging during transportation and are exposed to acid leaks when unloading and unpacking the palletized ULAB’s. They also have to deal with significant waste in the form of plastic wrap and strapping, as well as dry cell batteries that are “inadvertently” mixed up with the ULABs. Central to Battery Rescue’s battery collection service is the Battery Transport & Storage (BTS) Container. 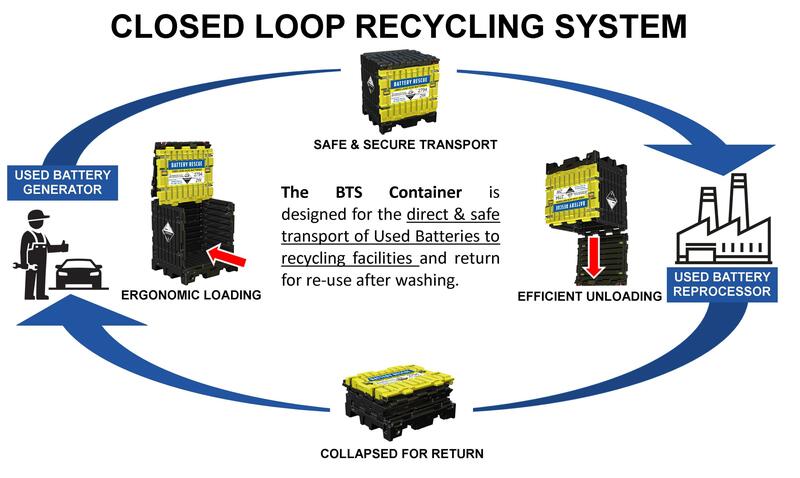 The BTS Container, was purposely designed for the safe storage and transportation of used lead acid batteries. The BTS Container has been specifically designed for the regulation compliant loading, storage and transportation of used lead acid batteries. When full it will store approximately 60 automotive batteries with a maximum gross weight of 1.2 tonne and can be closed and ready for immediately transportation within 15 seconds. There is no wrapping and strapping or Dangerous Goods labeling required and secured by the 8 self closing over centre latches (Snap-Flat) the Container is incredibly strong to ensure the safe transportation of the used lead acid batteries. It incorporates the unique Front Load configuration that allows the batteries to be ergonomically loaded in to the pallet and a Top Load configuration to enable the batteries to be automatically unloaded, using a forklift attachment, at the Battery Reprocessor without having to manually handle the batteries. The BTS Container can then be collapsed to a “flat pack” state for efficient reverse transport logistics. The Container also includes a bunded base, for acid spills, that can store up to 25 liters of free liquid and is weather resistant for outside storage and usage. 1. Battery Rescue provides the Used Battery Generator with a FREE BTS Container for the convenient, regulation compliant and safe storage of their used lead acid batteries. 2. Once full, the Used Battery Generator contacts Battery Rescue to arrange collection. Within several days Battery Rescue will collect the full BTS Container and deliver an empty exchange Container. 3. The full BTS Container’s are transported directly to an approved Used Lead Acid Battery Recycling Facility for certified weighing and the Used Battery Generator receives payment within 7 days. What Happens to the Lead Acid Batteries? The full BTS Containers collected by Battery Rescue, are consolidated in a holding yard, before 20 units will be transported by road to one of the Australian Lead Acid Battery Recycling facilities in NSW. Here the BTS Containers are automatically unloaded, washed and collapsed, ready for return. The recycling process involves breaking the batteries to recover the lead, plastic as polypropylene chips and sulphuric acid as sodium sulphate. More than 97% of the original battery is recycled with only a small amount disposed as slag. The recovered lead is predominantly used in the production of new lead acid batteries. The polypropylene chips are used in the manufacture of a wide range of plastic products and the sodium sulphate for detergents and fertilisers. 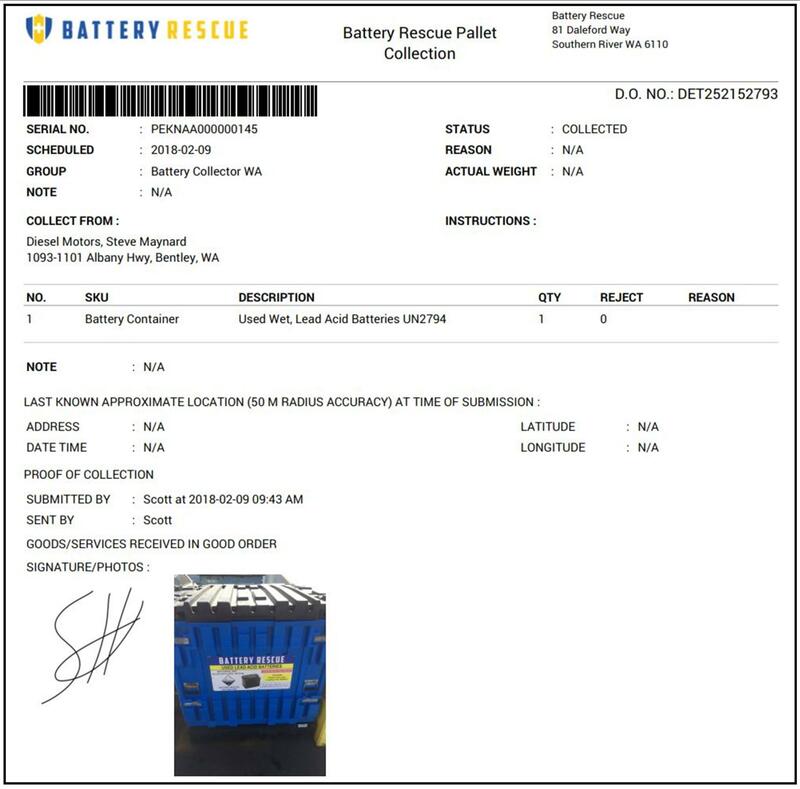 Battery Rescue’s collection system records the details of each collection, including the used battery collection statistics. This is achieved using a “proof of delivery”(POD) app. Each BTS Container has a unique serial number which is displayed on the front and rear of the pallet, as a barcode and in human readable form. The POD app enables the driver, using their smart phone, to capture the serial number of the pallet by scanning the Container’s bar code. The POD app also enables a photo and the customer’s signature to be captured. An example is show below. Battery Rescue has researched and trialed the use of battery powered GPS tracking / IoT Devices using either cellular networks and low power, wide area networks (LPWAN) such as Sigfox. Due to better coverage, the cellular connected IoT devices better suit our regional customer’s such as Western Australian mine sites. Future improvements in IoT devices and their supporting software platforms will enable alerts to be sent if the BTS Container has suffered an excessive shock (i.e. it has been dropped or involved in an accident) and to determine if the container is erected or in a collapsed state. 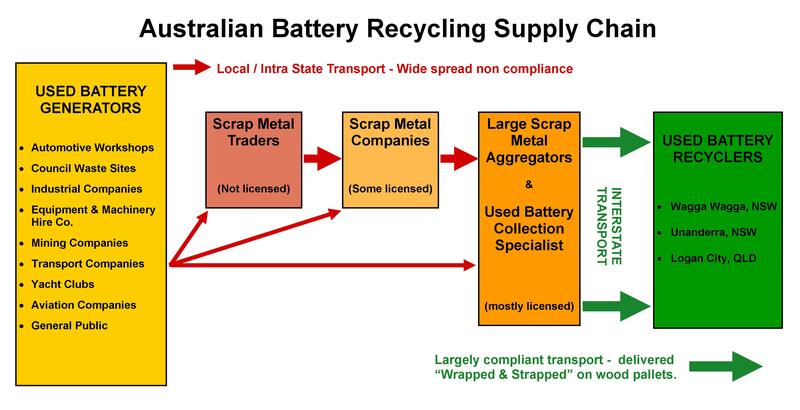 We believe the Battery Transport & Storage (BTS) Container and Battery Rescue’s associated collection service will result in a positive “Paradigm Change” in the Australian battery recycling industry because it will eliminate many inefficient, current practices but also deliver a safer, more environmentally sustainable and regulation compliant solution. Eliminating unsafe and environmentally damaging storage of a Dangerous Good and Controlled Hazardous Waste. Reduces unnecessary and unsafe lifting / stacking of batteries by employees and by battery collection service providers. Delivers “Duty of Care” and “Chain of Responsibility” and thereby reducing company’s legal liability risks. No load shifting/reloading on route and hence safer and reduced costs. Eliminates acid spills during transportation. Safer (more secure) and faster loading and unloading. Reduced human and environment exposure to toxic lead and acid. Safer (more secure) and more efficient unloading of batteries. Reduced acid spills and employee exposure to toxic lead. Delivers “Duty of Care” to employees. Automatic compliance by the whole supply chain. Improved environmental outcomes by reducing unsafe storage practices and increasing recycling rates. Comprehensive data and statistics and immediate detection and reporting of any accidents during transportation. We believe the Battery Transport & Storage (BTS) Container and Battery Rescue’s collection service will deliver a safer, more environmentally sustainable and regulation compliant lead acid battery recycling industry to Australia. The current battery collection practices are not only unsafe and environmentally unsound, they are very inefficient. Driven by companies wanting to meet their “Duty of Care” and “Chain of Responsibility” obligations while reducing OHS risks and their impact on the environment, we think Battery Rescue’s collection service will be the catalyst that creates the “paradigm change” in how the lead acid battery recycling industry operates here in Australia and elsewhere. For an overview of Australian lead acid battery regulations for storage, handling and transportation. For a more comprehensive summary of the lead acid battery storage regulations. For a more comprehensive summary of the lead acid battery transportation regulations. A map of Perth, WA, car battery disposal locations were the public can dispose of the their used car battery for recycling. UNISEG Products supplier of the BTS Container for storage of used car batteries and other lead acid batteries.